Cleaning products may not be the most expensive item in the house, but if there's a less expensive way of doing something, I'm all for trying it! The use of vinegar for cleaning is certainly frugal and effective, plus it's natural and non-toxic. I keep a spray bottle of half vinegar, half water on my window sill in the kitchen to wipe down the table and counter tops after use and use the same spray on fruit and vegetables as a quick produce wash. 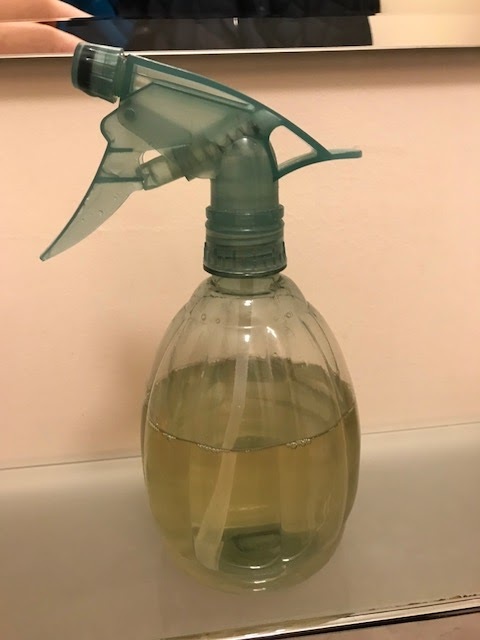 I use distilled/white vinegar to descale the coffee maker and to clean and freshen the dishwasher every 2 months or so; however, it has been a while since I used vinegar to clean the bathrooms. Simply fill a jar with leftover lemon or orange peels... I actually used clementine peels... fill with distilled/white vinegar and wait 1-2 weeks for the oils from the peels to be released into the vinegar. Jillee recommends heating the vinegar which expedites the rate of this process, so I'll have to try this next time. I poured the scented vinegar through a sieve into a jug, then poured it into the spray bottle. I did not dilute the vinegar with water as I wanted to maximize its germ-killing power for cleaning the bathrooms. Does vinegar actually kill germs? According to everything I read online, the answer is yes. According to this very interesting and informative article, the simple act of scrubbing effectively kills bacteria. Add to it vinegar and hot soapy water and you have a germ-killing powerhouse in your hands. I use a microfiber cloth to clean with, which also picks up bacteria within its fibers. The toilet bowl I scrub with a worn dish sponge, then discard it after use. Perhaps you're concerned your house will smell of pungent vinegar after using vinegar to clean with. The scent does last about a half hour, but my girls didn't mention it, nor did my husband notice it when he came home from work a little while later, so it probably wasn't too bad. I, however, noticed how very clean my bathrooms looked and am very pleased to say that I will continue to use vinegar - scented or not - to clean with.